Montpelier Joinery is brought to the market by the makers of Prime Oak; Andrew Whitlock and Warren Lowe. Our energy and passion for the best, as seen at Prime Oak, is echoed at Montpelier. Our goal is to provide 1st class products that are better performing and longer lasting than what the market has provided to date. Our burning desire to improve the lifestyle of the discerning homeowner with a product that enhances their lifestyle is bigger than ever. Knowing that we have the essence of a business model that will feed off itself perpetually, gives us the ability to invest more time and money into customer service, coupled with our low base costs, it will enable us to supply a 1st class product and 1st class service at value for money. As we are the best in our field we advise all clients to visit our head office to see our products in person before a decision on their preferred supplier is made. Fill in a few details about you and we will send you a brochure with all the information you need to make an informed decision. If you want to visit us to discuss more then you can request a site visit. Please note: We are in the process of creating our new brochure. All new brochure requests will be sent our new brochure as soon as it is complete. In the meantime, we are happy to arrange a complimentary site visit with one of our designers. Who are we sending the brochure to? Where are we sending it to? Why are you requesting a brochure? 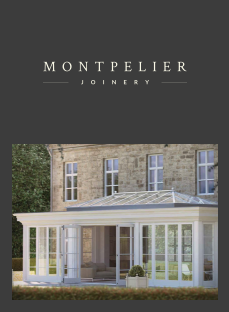 I would like to join Montpelier Joinery's Mailing list. By clicking send request, I agree to Montpelier Joinery's Terms and Conditions. © 2019 Montpelier Joinery. All rights reserved.